Identification: This is a small cream animal with irregular papillae. The papillae and rhinophores appear to be tipped with opaque white and the branchia appear slightly dusky. Natural history: Unidentified discodorid #17 is known from one animal found at an exposed to highly exposed site. 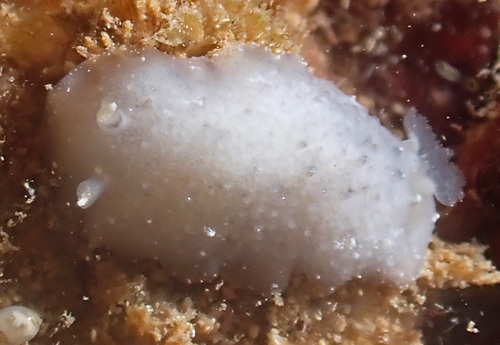 Taxonomic notes: It seems most likely that this species is a discodorid but the family remains uncertain (it was previously listed as "Unidentified Dorid #17) . It was first recorded in Hawaii from Makua, Oahu by Scott Johnson in Sept. 1979. Photo: Scott Johnson: 12 mm: Makua, Oahu; Sept. 1979.